here with the other panelists. (Brussels—Jan. 25, 2019) This past week, ChinaAid President Bob Fu spoke at various engagements highlighting the current state of religious freedom in China and the crisis in Xinjiang. 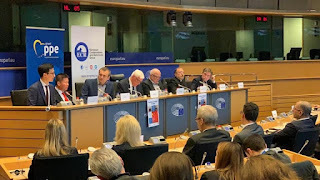 On Monday Jan. 21, Dr. Fu was part of a panel titled “Freedom of Religion in China” hosted by Members of the European Parliament Bas Belder, Josef Weidenholzer, and Christian Dan at the European Parliament in Brussels. The panel focused on the situation in Xinjiang and the crackdown on Christians throughout China. He was joined alongside a number of experts, including Director-in-Charge of the publication Bitter Winter Marco Respinti, AsiaNews editor Father Bernardo Cervellera, and Human Rights Without Frontiers Director and Co-Founder Willy Fautré. One speaker previously listed in attendance, Omar Bekali, a former Chinese internment camp prisoner, was unable to make it due to a visa issue and was replaced by Kuzzat Altay, an Uyghur activist. Kuzzat Altay said, "The only god to worship in China is Xi Jinping, the absolute king. But being a king is not enough. He wants to be god and be worshiped like god.” His speech can be read in its entirety here.